Have you ever heard someone tapping a pencil and then suddenly you can’t hear anything else but that annoying tap? There are sounds all around you but they are muffled or muted. Only the tap, tap, tap… The human mind is amazing. It seemingly hears what it “wants” to hear and focuses on things it “wants” to focus on. I can’t even begin to fathom its incredible complexities but what I see in athletes on a daily basis tells me that it is more powerful than we could ever imagine and that in a very big way your thoughts control everything your body is responsible for. Departing from Belarus this morning it occurred to me how many times the truth of competition tells us things that we don’t “want” to hear. In those moments we are always given a choice; accept, analyze, problem solve and adjust or sulk, block and (or) deny. Unfortunately for a lot of us we choose an emotion (or two) from the second list and continue down our path not a better; but a worse version of the athlete that we could be. The choice is always ours. The path to a better version of ourselves is mostly free of external obstacles but yet sometimes pride, ego, and fear change something that could spark progress into something we take as an insult to who we are. More specifically for wrestlers it tends to insult how good we are at doing the thing we love to do. If your identity is “I’m a good wrestler” and you lose then what are you? Where has your identity gone? You were there and now you’re not. So for self-identity preservation’s sake we choose to ignore and twist the truth to fit our perceptions instead of allowing the truth to shape our future actions. The real tragedy is that either way the truth remains unchanged but the outcome of each path is vastly different and our mind’s “wants” chose our path without us even knowing it. 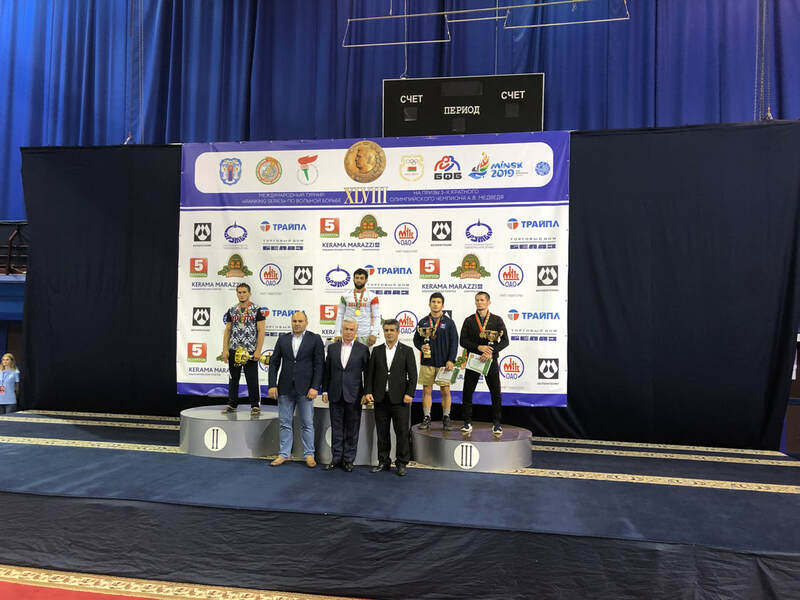 ​As some of you know Isaiah just took bronze at the prestigious Medved tournament in Minsk, Belarus this weekend. But behind the scenes the medal was only a byproduct of his decision to focus his “wants”. Leading going into the last minute of the semifinal, leading going into the last minute of the bronze match. Both identically skilled athletes but the Russian in the bronze match felt the pain of a semifinal lesson earned as Isaiah continued his attacking style through the last minute. The result - he beat the number 14 wrestler in the world 11-2 and left Belarus with what he came for … a better version of himself. If you are a young wrestlers let me let you in on a little secret - If you play the game you will lose and if at that point you stop shaping the truth and let the truth shape you then you will develop. And that is the goal… That is the ONLY goal. Train your mind’s “wants”, as you do your body. As for Isaiah, this is the best version of him to ever take the mat and he is hungry for more. The future is bright! Since our last update we have hosted two really important social events and we are really proud to say they were both very well run and well attended. First we had a very successful golf outing at the beginning of August. The event was extremely well ran by our committee, special thanks to Tim Drollinger and IRTC Board President Steve Hall for their countless hours of hard work. 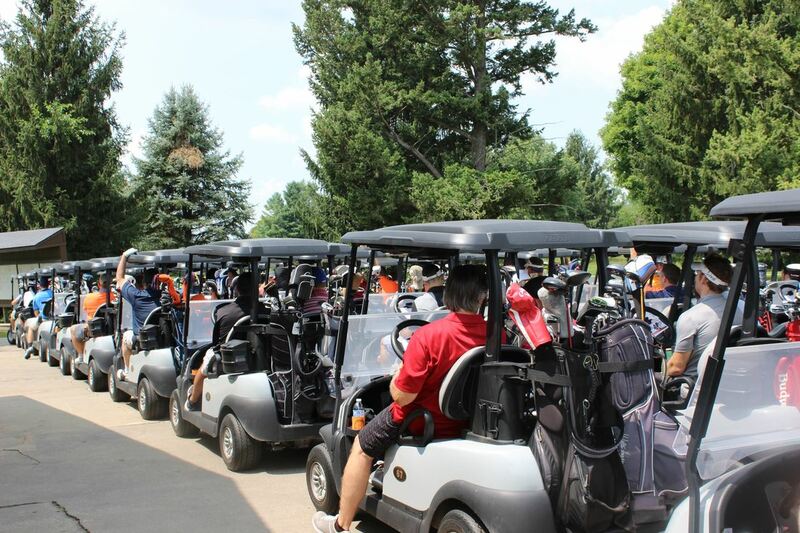 Illinois Wrestling supporters took to the links in record numbers on a beautiful day and enjoyed being part of, and giving back to, the Illinois Wrestling Family. The date is already set for next year - July 27th at the University of Illinois Golf Course in Urbana. We also had our first IRTC tailgate last weekend and even the rain couldn’t stop us from having an excellent time, special thanks to Brian and Angie Rich as well as Dawn Gasbarro for making it such a great afternoon. If you are in town for the game this Friday against PSU, please plan to join us for some great food, fellowship and maybe a game of bags as the Illini prepare to take on the Nittany Lions. 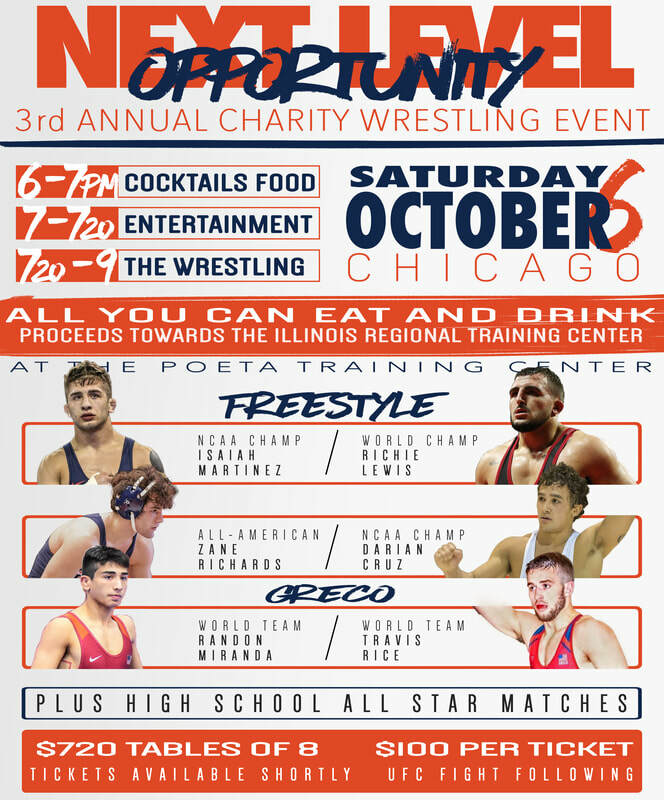 ​On deck for the IRTC, is the Next Level Charity Wrestling Event in Chicago. This promises to be a night to remember. We have Isaiah Martinez taking on World Champion Richie Lewis, Zane Richards taking on NCAA Champion Darian Cruz and World Teammates Travis Rice and Randon Miranda set to do battle. That’s just the main card and the high school matches might even be more interesting as we have state champions taking on world champs and nationally ranked wrestlers from all over the Midwest set to do lace ‘em up for a great cause. All the food you can eat, all the beverages you can drink, a high level wrestling event, the UFC and guest wrestling celebrities. We even have comedian Joe Rau taking the stage to warm the crowd up. You heard that right! World team member Joe Rau will give us all something to laugh about before we get down to business. You can buy your tickets or find more information about the event by clicking HERE. Do it early as seating is limited and once it’s gone it’s gone. 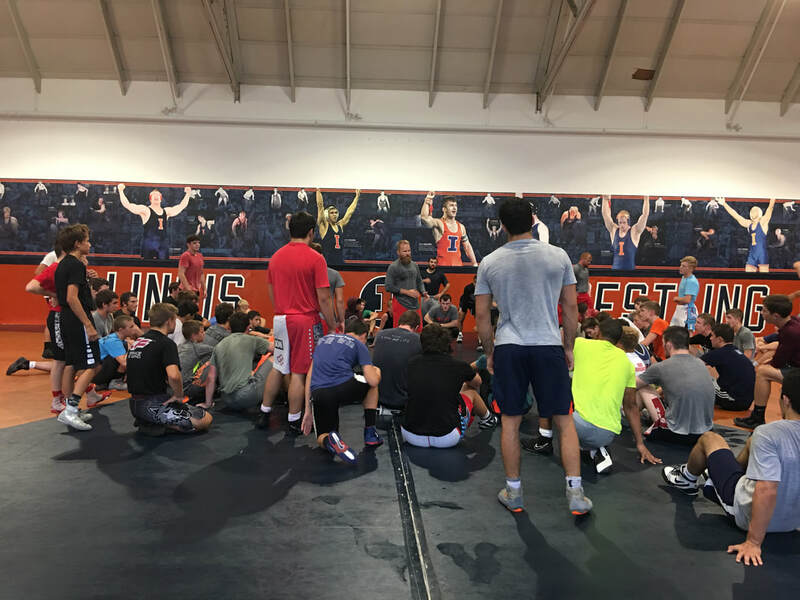 The IRTC regular practices started off very strong this year after a great ending to the US Nationals in Fargo, North Dakota. In all the HS athletes that regularly train at the IRTC had 5 National Champs, 5 finalists, and 18 total All-Americans – we would have taken 2nd as a state overall if you were wondering. It was a great year one and they are already working hard to make sure we only go up from here. You can catch regular practice on Tuesday and Thursday at 5:30pm and keep an eye out on the website for special training camps and gear as both become available. ​We want to thank all of the donors that have given this past year and encourage anyone that is willing to step up to the plate to go to bat for these young men. As I get to see them every day, I am always impressed with the diligence and pride that these guys have in their school and their state. They compete for each one of you but without you none of them would be able to compete. Click HERE to give and please consider a monthly gift as we have an eye towards towards the future. ​I want like to end with a special congratulations to Isaiah and Zane for being chosen as training partners for the world championships. Each senior world team member has their choice of partners and both were selected, by Nashon Garrett and Kyle Dake respectively. It will be a great experience but more than that I think that it speaks volumes to the type young men that we have in this program. They are the type of people that elite athletes want to be around; selfless and humble. Kudos fellas and enjoy the experience because next year maybe you can reciprocate the offer. Last edited by IllinoisRTC; 09-19-2018 at 07:36 AM.